Blue Smoke and mirrors: Mirrorcake 04 features deep blue mirrored lenses over a matte black metal frame. Temples are matte black acetate. The black silicone nose pads are hypoallergenic, and blue opal side inlays complete the look. 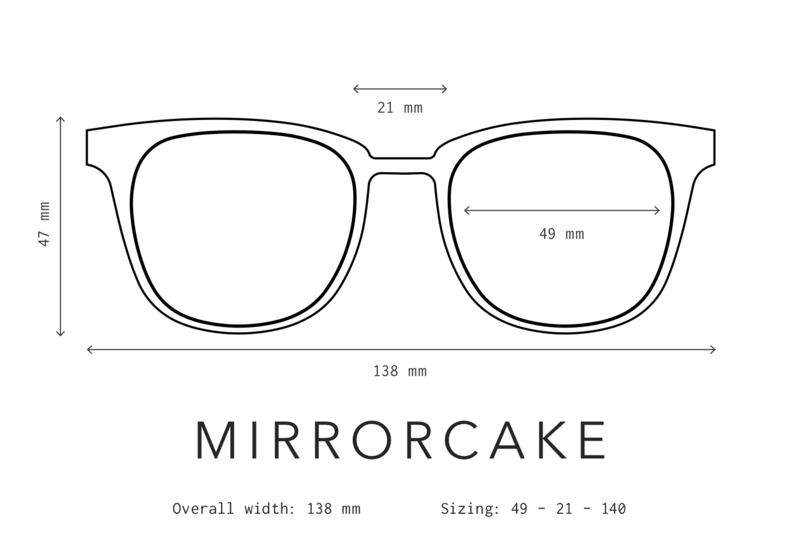 Layer it on: Mirrorcake is a flexible mixed material frame. The silhouette mirrors our super-popular Vanguard shape but is constructed entirely of rimless “floating” mirrored lenses, layered over a lightweight metal chassis. Each frame is meticulously handmade in Japan and features high-quality shatterproof lenses with 100% UV protection. The shape was designed to be flattering on all faces. Its super-durable surgical stainless-steel construction and smooth, high-quality hinges ensure these will be your favorite shades for years to come. A sharp and modern take on the classic Vanguard silhouette, Mirrorcake features floating zero base mirrored lenses with an engraved front. It's a bold new rimless design with high-definition, but look closely and you'll also notice that the metal chassis layered behind the lens echoes Vanguard's half rim design. The end result is a striking mix of smoke and mirrors.